We are excited to introduce award-winning Chef Cole Dickinson, the executive chef at MacArthur Place. Chef Cole will oversee all food and beverage operations for Layla, The Bar at MacArthur, The Porch, weddings and social events, poolside dining, and the in-room dining program. Chef Cole joins us from Acacia House at the Forbes 4-star Las Alcobas Resort in Napa Valley, which was recently named one of the Bay Area’s best 100 restaurants by the San Francisco Chronicle. 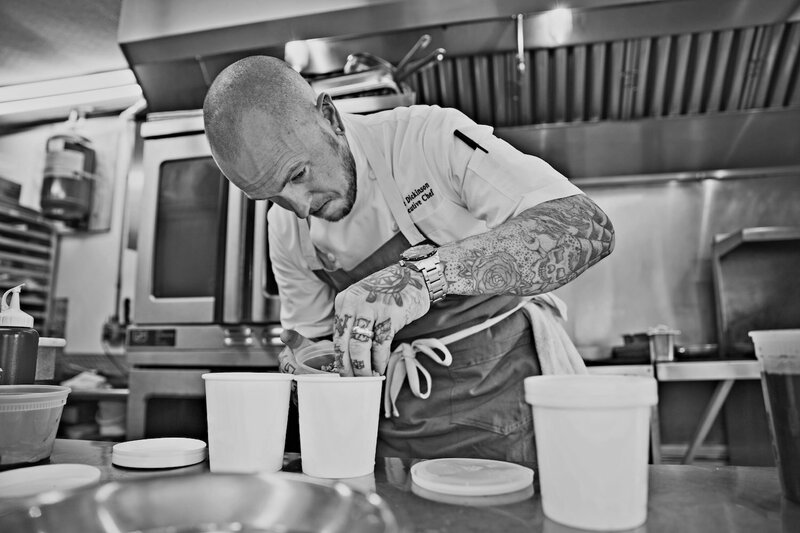 He brings a vibrant culinary pedigree to Sonoma, having worked for years as a protégée of Chef Michael Voltaggio, first at Charlie Palmer’s Dry Creek Kitchen in Healdsburg, followed by Voltaggio’s Hemisphere at the Greenbrier in West Virginia and then at The Bazaar by José Andrés in Beverly Hills. He was named executive chef at the Voltaggio Brothers Steak House and helped to oversee the kitchen at Michael Voltaggio’s wildly successful ink, named a GQ magazine “Best New Restaurant in the US” in 2012, as chef de cuisine. Chef Cole answered a few questions about how he is preparing for the opening of Layla and how he spends his time outside of the kitchen. How do you stay fit, healthy and sane despite the long hours, frenetic schedules and endless stream of sumptuous food? I love to ride my bike. I am involved with a charity call Chefs Cycle which benefits No Kid Hungry. I started almost 3 years ago and my goal each year is to ride 5k miles outside of Chefs Cycle and raise $10k for the cause. Also, there is a difference between eating and tasting. I am tasting ALL day long. But, what I choose to eat when I “sit down” for a meal is wholly different. Of course, there is always time to cheat…I may “taste” the oatmeal-miso cookies 5 or 6 times just to make sure they are up to par. Are you doing research & development on any fun dishes or ingredients? Even though it is still freezing cold here in the Bay Area, we are starting to see a range of spring ingredients from warmer areas in California. There a few seasonal ingredients that I particularly love working with, and eagerly anticipate each year: morels and wild onions to name a few. We have been finding new and creative ways to preserve foods to extend their life cycle, and this season we will be applying it to our favorite ephemeral spring ingredients. What is your most memorable experience as a chef? My culinary career has provided me with countless exciting experiences all over the world. One of my most memorable was my trip to Austria with Chef Wolfgang Puck, including a double-header dining experience at two of Austria’s (and arguably, the world’s) best restaurants. Our journey began at the Pogusch Country Inn, essentially the farmstead sister restaurant to Steirereck, and was followed by an unforgettable meal at Steirereck. We were treated like royalty everywhere we went. I was in my early 20’s then, things like this don’t happen too often. Which local farms or food purveyors are you most excited to work with for Layla? We are particularly looking forward to working with Beffa Springs Ranch, located about 20 minutes from our property. We will be working closely with them to raise lambs and pigs as well as trying to utilize their cattle as well. Aside from their amazing livestock, they have 300 acres of forageable wild land as well as a small produce garden where we will source amazing-tasting ingredients for our restaurant. We also look forward to working with Flatbed Farms — great people committed to the local community and sustainability through agriculture, and also supporters of Chefs Cycle. As a chef, is there anything you do to promote sustainability? We are constantly trying to think of ways to be more sustainable in the way that we work. One recent initiative is utilizing local partnerships to drive sustainability. Through our relationship with Beffa Springs Ranch, for example, we have devised a closed-loop system of sorts to minimize waste. We will feed their pigs using food waste from our kitchen (carrot peels, onion scraps, lettuce cores, etc. ), and in turn, buy those very (well nourished) pigs for our restaurant ingredients. This is something we are very excited about especially since food waste and the resulting landfills are a serious problem. What aspect of the new kitchen or piece of culinary equipment are you most excited about? I am a simple man and like simple things. The epicenter for our new kitchen, in my humble opinion, is the “plancha” — a piece of equipment that we had in the kitchen at ink and I haven’t used since. The plancha is a big metal plate that gets incredibly hot and essentially works like a giant saute pan. It’s great for searing small pieces of seafood and other ingredients that need a flash of high heat to avoid overcooking. Which of your new dishes have the most unique table-side presentation? Salt-baked fish is nothing new. But one of the things that makes it special at Layla is the fact that we cook it a little differently, all the while staying in line with tradition. We wanted to get away from that awkward moment at the table when the server is standing there for 3 or 4 minutes scraping every last piece of salt off of the fish. We thought that if we layered damp kombu over the top and bottom of the fish we would still be able to get the “salt baked” effect without the weird “scraping”. With this technique, one of our lovely staff will wheel to the table, remove the salt “lid” and simply roll back the kombu sheet revealing a beautifully cooked whole bass. This is presented with a caper chimichurri, grilled lemon, tiny greens, and shaved vegetables. What’s your favorite dish on the new menu? Which dish best defines the “Layla” style? My favorite dish on the menu would have to be the “patatas bravas”. What we’ve done is take this simple Spanish bar dish (this is where I first had it, in a bar, in Spain) and elevated it. This dish defines Layla perfectly in that it derives from the “greater” Mediterranean region and been thoughtfully and creatively prepared in a new and delicious way. We make a smoky, spiced tomato sauce and season it with lacto-fermented tomato water. It is topped with our homemade, crispy “tater tots” and served with an aerated garlic aioli. This is a dish I think our guests will eat…and then order another one. What would you recommend off the all-day menu for a late-night snack by the firepit? For a late night snack by the fire pit, I would definitely recommend the parker house rolls. Brushed with warm butter, seasoned with flaky sea salt and served with rich chicken gravy for dipping. If I was in a sweet mood, I would go for the apple pie “in a pint”. This is a classic dessert served a little differently. We have custom-made pint cartons that we fill a ¼ of the way with burnt cinnamon ice cream and top it with stewed apples as well as an apple pie crust crumble and sea salt caramel. Do you source any ingredients from the property? This past year we were able to source 3 ingredients from the property. Figs and pomegranates from our tree as well as wild blackberries from the bushes on our creek. This year we will be building raised beds so that we can grow a lot of our own herbs and other ingredients to be used in the kitchen. We are excited to share MacArthur Place’s new food and beverage concepts, including Layla, The Bar at MacArthur, and the Porch, an all-day stock-house featuring handcrafted and local products. Layla—named for Leilani Burris, great-granddaughter of property founder David Burris—will feature an inspired Mediterranean style menu. The Bar at MacArthur will see an inspired menu of craft cocktails and all-day bites featuring herbs, flowers, and ingredients from the property’s grounds.